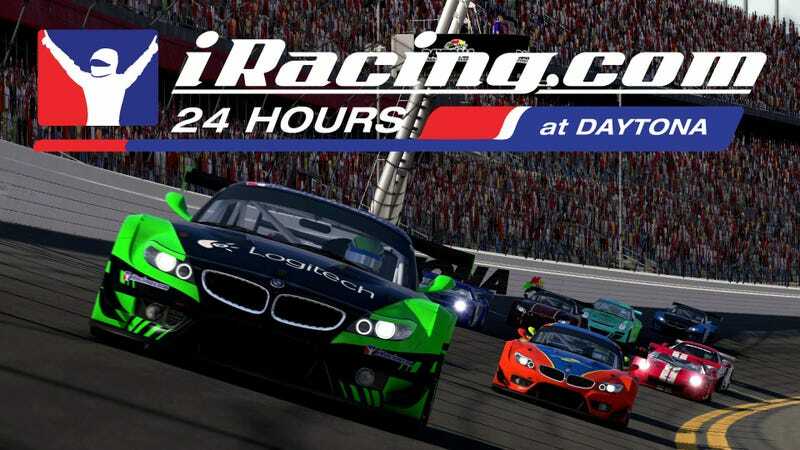 Though the real 24 Hours of Daytona is over 2 weeks away, it is only 1 week until you can run the 24 Hours of Daytona yourself in the iRacing 24 Hours of Daytona. You will have 2 classes to choose from: the Chevrolet Corvette C7 Prototype class or the GT class (Ford GT, “Porsche 911" (RUF GT3), BMW Z4, or McLaren MP4-12C). No matter which ride you choose, these basic tips will help you and your team make it the full distance. They may not take you to victory lane, but getting to the finish line at the end of 24 hours is a victory itself. Luckily, Daytona is not a difficult track. I find Turn 5 to be the most difficult corner on the course. I always seem to carry way too much speed into the corner. However, Turns 3, 1, and the bus stop are also challenging. Establish landmarks be they cones, signs, or other objects to know when to brake into a corner. This is imperative for Turn 1 especially as you carry a lot of speed into that sector. Increase your laps done until you feel comfortable. Start with 3, then 5, 10, 20, 30, and so on. Once you become comfortable with the car and track, do some practice pit stops. If possible practice with your teammates switching drivers and so forth. Know how long each thing will take so you can make efficient pit stops during the event. Do 1 entire fuel run in practice so you can best estimate how much time it takes to use a full tank. Because this is a timed race, you should base everything on time, not laps. If I recall last year, the “Porsche” had about 1 to 1.5 hours of fuel, other cars will vary. This allows you to plan your driving schedule and strategize how you will make it to the end of the race. Many incidents in a race like this are caused by collisions between cars of different classes. This is mostly because of speed differentials combined with low visibility and general stupidity. The C7 Prototype is much faster than the GT cars and has much better handling. This will cause them to A) Catch up to you very quickly and B) encourage them to make borderline stupid overtaking maneuvers. The better you can react to traffic, the safer and faster you will be. The most important thing to remember is that even though you are on the same track – YOU ARE NOT RACING CARS THAT ARE NOT IN YOUR CLASS! You don’t need to go toe to toe with them or try to keep them from passing you. This just makes them angry and increases the possibility for an accident. The best way to deal with this is to practice. iRacing offers a number of multi-class series that I would suggest dipping into to get a feel for the multi-class racing environment. Have an idea where the best spots are in the track for the faster car to overtake so that it minimizes the side by side action. Side by side racing will slow both of you down. Thankfully Daytona has plenty of good places to facilitate yielding to faster cars. The entire Superspeedway section is excellent as there is plenty of room. Other good places are the entries to Turns 1, 3, 5, and 6. For both classes it is good to note that it is the responsibility of the overtaking car to pass safely. However, this does not mean the slower class car can do whatever they want. Be courteous and give room; however, most drivers understand that there are better areas to pass than others, so don’t worry too much. *One more thing I suggest driver do is practice crashing. Not many people do this. It is important to know how to react once the car begins to go in a direction you don’t want it to. It is also important to know how a car will feel once it has been wrecked so you can navigate back to the bits safely. Every race team makes plans for each race and 95% of the time they don’t go that way. This is no exception. Most of these teams will have 4 to 5 drivers. It is important for the team organizer to allot time efficiently. There are 2 important rules when allotting time. 1. Make sure that everyone drives the minimum amount of time required – iRacing has a rule that all drivers must drive a fair share. A fair share on iRacing is 25% of an equal share. Therefore if there are 4 drivers, each one must drive at least 1.5 hours. If that requirement isn’t met, your team will be disqualified. 2. If possible, try to have 2 team members online or able to be contacted. This way if there is an emergency like the internet crashing or sudden diarrhea, a relief driver is available. 24 hours is a long time to be in-game and disconnects do happen. The best way to plan shifts is around pit stops. The car already need tires and fuel, might as well put a new driver in there too. I know when I managed the shifts last year, I messed it up badly and tried to force everyone on 2 hour shifts early then had long stint during the night. In retrospect, that was dumb. Do a pre-flight check before race day. Make sure the settings on your wheel are good so it won’t overheat. Have snacks and drinks nearby for the journey. Remember you are not in an actual racecar so you could bring the pantry if you wanted. If possible have a backup wheel or controller nearby in case something breaks. Practice potential disaster scenarios if you really want to. So here we are, the cars are on pit road, your teammate is sitting in the spotters stand while you put on the belts, and the other 2 are sleeping. The most important times in a 24 hours race are the first 24 minutes and the last 240 minutes. In road racing there is an adage “Lap 1 Turn 1.” Most of the time things go wrong here. The best way to combat this is to remember that this is a 24 hours race. You cannot win it in the first 1000 feet. Be cautious entering, be sure to check your surroundings, stay to a path and make sure you have escape routes. A lot of stuff will happen between now and the end of the race. Making sure your car is on track is the key to a good finish. Others will have problems if not now, maybe in 17 hours and 20 minutes. It doesn’t matter that you are in 63rd place on Minute 1, it matters on Minute 1440. Many drivers have ruined their chances for a good race in turn 1 of the first lap. Don’t let it be you. This is the time where your strategy comes to play. Did you time out your fuel correctly? How far ahead is the guy in front or behind? How many laps will we lose on the next pit stop? What will they do? These are many questions that will soon have answers. Some teams plan for this moment weeks in advance of the race, others plan for it at Hour 18, either way, it is do or die time. There are two things the driver doesn’t want to do, wreck the car on the first hour, or wreck the car after 23 hours. The race ebbs and flows. The beginning starts with high adrenaline and excitement until everyone settles into their rhythm (usually after the 2nd or 3rd pit stop). Then is a period of general riding around with a battle for position here and there. However, the excitement builds back up as the race draws to a conclusion. Don’t let it get to your head, try to focus back on the ultimate goal – crossing the finish line when the clock strikes 0:00. If you follow some of the tips I have outlined, admittedly, you probably will not win. But in a race like this, winning is only icing on the cake. To get a bunch of friends together and operate a car for 24 straight hours is something that itself is a feat. If you can do so without crashing hundreds of times it is even better. These tips are here to help people that are new to sports car racing and/or need a refresher on how to make the most of your race. If you need any more information regarding things about the race or your car, be sure to check out the respective section in the iRacing forums. If you are racing in the 24 Hours I wish you best of luck. I will not be able to participate this year because I am going to NAIAS that day, which looking at the lineup of cars is going to be great. If you want to watch the race, RaceSpot TV and iRacing Live will broadcast the Top Split on YouTube. The end of the off-season is upon us.